Like many homeschooling parents of gifted kids, I was a reluctant, last-resort homeschooling mom. It was frightening to leave the familiarity of the public school system and disheartening to learn that other schools weren’t a good fit, either. Once the initial shock was over, however, homeschooling became so much more than just the best of the inadequate options I had thought it would be. It was exactly what my child needed to thrive, and we haven’t looked back since. This does not mean that every day is filled with sunshine and rainbows. Sometimes we fall into ruts, but because of the inherent autonomy of homeschooling, it never has to stay that way. It’s up to me, and sometimes to my child, to fix it. Our pitfalls sometimes come from smaller issues pertaining to curriculum or our environment, sometimes from larger issues that require professional help, or sometimes from my own personal issues. Homeschoolers of gifted kids know that just because something works now, that doesn’t mean that it will work later. When my son and I fall into curricular ruts, I used to blame it on my choices, and I felt the urge to scrap it and start with something new. While this is best sometimes, I learned from my favorite teacher that working with a student’s learning style and making modifications to the environment and curriculum can go a long way. My mom is a public school teacher and has spent most of the past 30 years teaching children with autism. She teaches in a centralized structured classroom which has a low student to teacher ratio. In her class, students receive a truly individualized education. Her dedication to her students has always inspired me, and from her experiences, I have learned some teaching gold. Years ago, she was working with a student with autism and intellectual disability. She was certain that his abilities were higher than he had shown, but it was challenging for him to focus on their lessons. During a math lesson, my mom was attempting to get her student to engage with her, but every time she asked him a question, his response was “umbrella.” He was fixated on a golf umbrella that was just outside the classroom. Having exposure to this style of teaching at an early age helped shaped me into the type of teacher my son needs. There are numerous ways to personalize the curriculum and environment for homeschoolers (some strategies can work for teachers in traditional classrooms, too!). Of course, we can fine-tune these word problems so that we are comparing Rebel Troopers and Imperial Forces instead of bushels of apples and oranges. Sure, let’s get that huge crash pad, and my son can be upside down on it during read-alouds and discussions. We can work on handwriting in other creative ways at another time. Yes, let’s make a classroom filled with action figures and plushies, and my son can “teach” them to show his understanding of a topic instead of taking a test. In our first months of homeschooling, I didn’t understand why my son couldn’t hear the difference between short vowels and long vowels when he was seated next to me, but he could call them out perfectly when he was jumping in the middle of the room. Later, I remembered my mom’s mug, and I knew this is what it meant. When we are in a rut that goes beyond the scope of these smaller modifications, I take a step back to figure out why my child is struggling. Gifted kids are complex kids. Homeschooling one is not easy, and it may require much research when things aren’t going well. Only a few months into homeschooling, I knew I needed outside help. My son is 2e, or twice-exceptional: gifted with other special needs. At that point, he had already received an autism and sensory processing disorder diagnosis, but none of the evaluations even touched on the extent of his giftedness. I was struggling to homeschool him because his strengths and weaknesses were extreme. I found an educational diagnostician who had experience with 2e kids. The formal assessments, including IQ and achievement tests, proved to be priceless. This gave me the confidence to do more than modify curriculum. We needed to move up a few levels… but only in some areas. I learned how I could accommodate him in areas of weakness without holding him back in others. It would have taken me many painful months to figure this all out on my own. Another instance when we needed outside help: my son could read before he turned three years old, but as he was progressing into books with more words per page, he would get upset to the point of tears, saying he was too tired to read after a page or so. I noticed other issues, too, but I did not know they were related to his reading until I saw parents in gifted groups discussing visual processing disorder. I recognized many similarities. After several months of research, I decided a formal evaluation was worthwhile, and sure enough, he was able to benefit from vision therapy. We are in the early stages, but only a few weeks into therapy, he is already starting to read independently again… without me asking him to! I believe that the more information you have, the better. Yes, gifted kids are asynchronous, but if my gut is telling me there’s more to it than that, I seek professional help and get answers. While I know that homeschooling is the best fit for my child, that doesn’t mean that I never feel pangs of guilt, worry, or even sadness when I consider the opportunity costs of the choice. When I start to fall into these emotional ruts, what works for me is to stop – just completely stop – and to remind myself of what I truly value, as well as to be grateful for what we do have, instead of worrying about what we do not have. For instance, if I start to worry about what my child will miss out on by not being part of a public school, I remind myself that for every positive aspect of public school that we gave up, we have gained multiple times more on the other side. So, while it’s true that my child isn’t getting to experience the neighborhood kids’ social bond of shared school spirit, he now has an amazing group of friends he met by hanging out at a science discovery center for hours every week during the school day. Through a gifted homeschool group, he has met friends who he has more in common with, and we have extra time for therapy to support him when he wants help with social challenges. Another example of an emotional rut involves the loss of my career. Sometimes I daydream about the satisfaction I received in my career: working with peers, career advances, continuing education, and the benefits of increased finances – such as travel and cool new “stuff.” These thoughts can be particularly hard to push aside since this is still the norm for most people in my life. When I was making the decision whether to homeschool or not, one concern was that I would miss my career too much and that I would no longer be marketable when I could return. While discussing pros and cons with my brother, he commented, “No one looks back on their life and regrets spending more time with their kids.” This was powerful to me: I second-guess many of my decisions, but I knew, without any doubts, that this statement would be a guiding truth for me. So, while I might not be booking a European vacation anytime soon, I have been given the gift of time, and I can’t think of anything more valuable to me than that. Homeschooling my 2e child means that many aspects of my life are not remotely similar to many of my friends’ and family’s lives, or to what I had imagined for my own life. We fall into our fair share of ruts, but we don’t have to stay there if we remember to take ownership of this choice and know that we are in control. We must be flexible and creative and know when to ask for help. Most importantly, we must remember to put our energy into what we value most, and to express gratitude for our blessings. 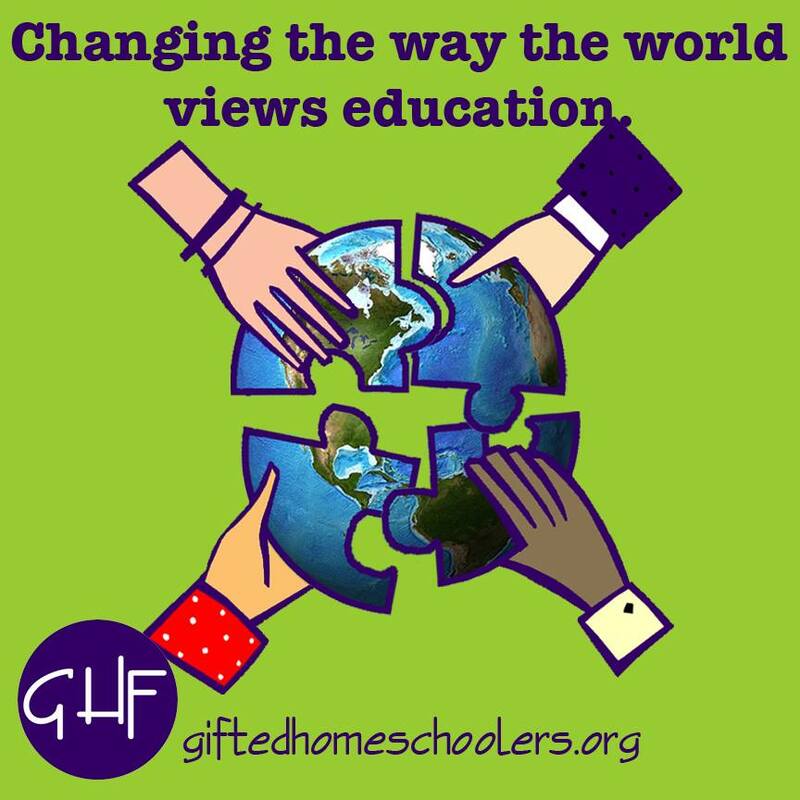 Our blog is proud to participate in Gifted Homeschoolers Forum blog hops! For more tips from other gifted homeschoolers, please visit the February 2017 GHF blog hop. Thank you, Lucinda! I just read your post and the feeling is mutual :-). It’s going to take time for you to adjust to your new life, but you will. Your journey doesn’t sound too dissimilar to mine and many others. A lot of us make huge sacrifices in terms of a career, income, and lifestyle. Ditto for your son not being in public school. Then, it’s all the special needs issues with your son. I know. Been there, done that. Also, talk and listen to many other 2e and special needs parents who are homeschooling that you can. I think you’ll find that you have things in common and that helps as well. Thank you for your encouraging words . Yes, it has been a pleasant surprise to find that we are finding more new friends with shared experiences since making the switch to homeschooling. I love the umbrella theme you’ve used, and it sounds like you have a great role model in your mom. “Flexibility, creativity, and knowing when to ask for help” — the keys to success in many aspects of life. Thanks for sharing your experiences! Oh, I love this! You show such patience and passion for helping your child, when a lot of people would simply get frustrated and angry. You’re so right – following your gut as a parent is crucial when dealing with 2e kids. I just wish I could get my kid’s doctors to trust my gut as much as I do 😉 Thank you for mentioning vision therapy, as that’s something we need to look into as well. Great post! Thank you and best of luck on your journey! We have had the need for plenty of 2nd and 3rd opinions…when time and money allows them 😉. “No one looks back on their life and regrets spending more time with their kids.” You’re so right. You’re also lucky to have such an inspirational mom. I feel that same guilt, frequently. We have a similar diagnosis, and when I started homeschooling almost everyone had strong opinions about our ability to serve our daughter appropriately. Glad to know I’m not the only one who feels those moments of insecurity. Thank you, Ginny! It is comforting to know that others feel the same way…it’s also great when some of the doubters start to agree that you made the right decision 😀.